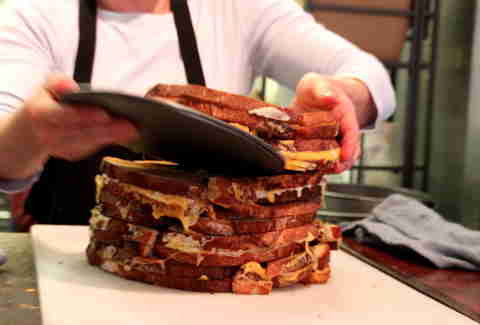 We don't quite know how to break this to you, so we're just gonna go for it: The American Grilled Cheese Kitchen has been hiding a secret so great, Nic Cage would make two terrible movies about it. 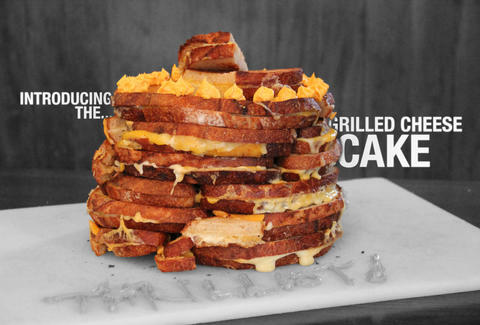 They've created an entire cake made out of grilled cheese sandwiches that you can order from either of their shops. "Wait, WHAT??" you say. "Shhhhhhh," we reply comfortingly-and-not-creepily, "Look at these pretty pictures showing you how." 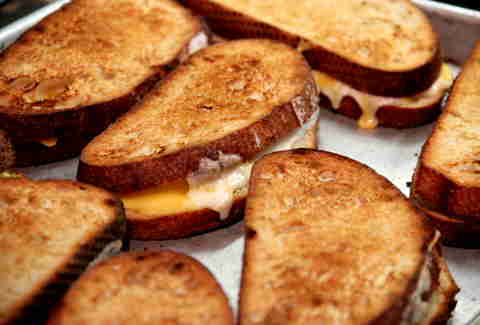 ... toast to delicious, crispy-on-the-outside-gooey-on-the-inside perfection. Oh yeah, and they do this with several sheets of these babies, because this cake is a monster. 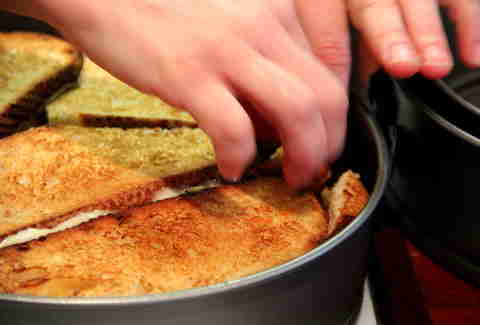 They then immediately start fitting these grilled cheeses into a traditional cake tin. 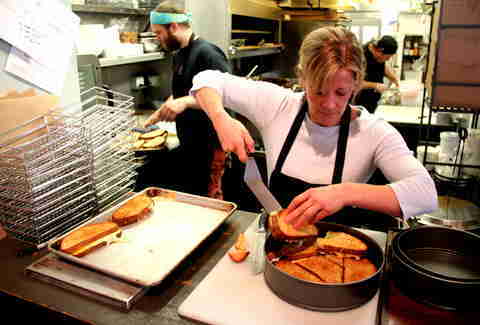 ... which requires some puzzle-crafting skills using a knife and anywhere from 25-35 sandwiches. Originally made for a(n awesome) friend's wedding, this cake is actually three tiered. 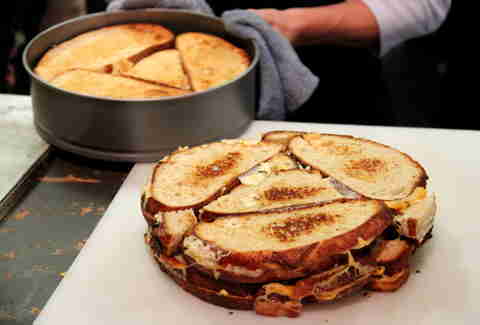 Plus, if you want extras, they are more than willing to add layers of bacon, or jalapenos, or bacon, or dude really just get the bacon, or... bacon. 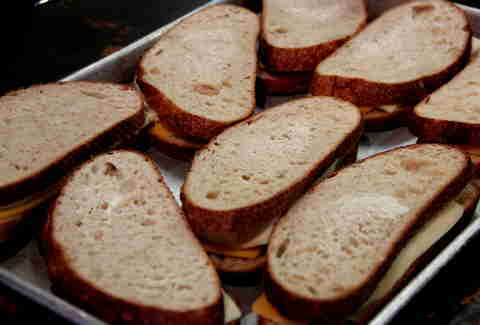 For now, they're topping the whole thing off with Cheez Whiz flourets, but there's also a super-secret cheddar frosting currently in the works. 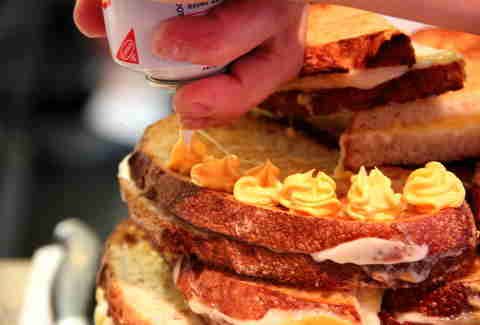 And here it is, in all its glory: three tiers of 30-ish grilled cheese sandwhiches, Cheez Whiz flourets, and the ability to be the guy with the coolest birthday cake ever. So, how do you score one of these? Just give 'em 48hrs notice and email either their South Park location or their Mission location, depending on which spot you wanna pick this baby up from.